Welcome back to my Writer Wednesday series. I’m going to open up the NY school year (I know many of you have already been back at school for a while) with a book I read in the Spring and really enjoyed: The Reinvention of Edison Thomas and its author my Class of 2k10 mate Jacqueline Houtman. Eddy Thomas can read a college physics book, but he canâ€™t read the emotions on the faces of his classmates at Drayton Middle School. He can spend hours tinkering with an invention, but he canâ€™t stand more than a few minutes in a noisy crowd, like the crowd at the science fair, which Eddy fails to win. When the local school crossing guard is laid off, Eddy is haunted by thoughts of the potentially disastrous consequences and invents a traffic-calming device, using parts he has scavenged from discarded machines. Eddy also discovers new friends, who appreciate his abilities and respect his unique view of the world. They help Eddy realize that his â€œfriend,â€ Mitch is the person behind the progressively more distressing things that happen to Eddy. By trusting his real friends and accepting their help, Eddy uses his talents to help others and rethinks his purely mechanical definition of success. Jacqueline spent way too many years learning to be a scientist (27, if you count kindergarten). The best part of all that school is that some people, especially her parents, now call her Dr. Houtman. In the rare moments she did not spend in the lab, she did theater to feed the rest of her brain. Then she came to her senses and started over as a freelance science writer and editor. She has written for physicians, scientists, and the guy down the street. She is equally comfortable writing for students in Medical School and Middle School, because the writing isnâ€™t really that different. Med students just use bigger words. The writing she enjoys most is â€œsciency fictionâ€ for kids, where science is integral to the theme and plot but, unlike science fiction, itâ€™s all real. 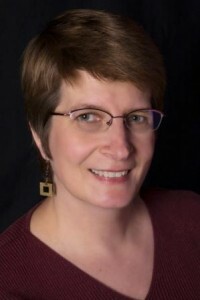 Jacqueline lives in Madison, Wisconsin, with her engineer husband and two sciency kids. 1. 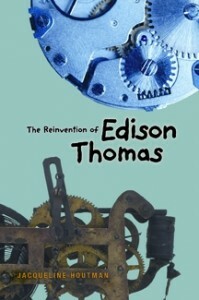 Tell us about your background and what let you to write The Reinvention of Edison Thomas. I went to school for many years to learn to be a scientist. 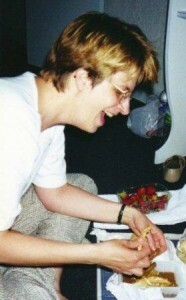 Then, about ten years ago, I started doing freelance science writing. About five years ago, I started writing for middle school-aged kids, mostly stuff for educational markets. I got one assignment to do short fictional pieces with a lot of science content. I loved being able to use dialogue and humor. About that time, I rediscovered middle grade novels. I also read The Curious Incident of the Dog in the Night-Time by Mark Haddon. That gave me the idea to write a middle grade novel from the point of view of a kid on the autism spectrum. With lots of science, of course. 2. I love the title. At what point in the process did you come up with it? Eddyâ€™s name has always been a part of the title. I came up with the idea for the name from my caller ID. Whenever my friend Doug Kirk calls, the caller ID says itâ€™s Kirk Douglas. So I took the idea of name reversal and ran with it. Eddyâ€™s dad is Jefferson Thomas. He has an Aunt Aquinas, an Uncle Paine, an Uncle Sawyer, and a Grandpa Beckett. For the longest time, the title was The Random Access Memory of Edison Thomas. It wasnâ€™t until I was rewriting the synopsis for the submission that was ultimately acquired that I came up with â€œReinvention.â€ Eddy reinvents both his devices and himself. 3. What’s the nicest thing someone has said about the book? Itâ€™s always nice when people say they love the character. And Iâ€™ve had a couple of people on the autism spectrum, both adults and teens, say that the portrayal of Eddyâ€™s Aspergerâ€™s syndrome was accurate. The most touching thing was that a couple (one of whom is on the spectrum) read it together and it opened up a conversation they had been avoiding for years. Itâ€™s one thing to have readers enjoy your book. Itâ€™s quite another thing when your book can actually have a positive effect on their lives. 4. Have you gotten any letters or reader reactions that surprised you? Some people have objected to the fact that I never mention Eddyâ€™s Aspergerâ€™s syndrome, or that the adults are too unsympathetic. Some have complained that there is too much science. In my opinion you can never have too much science. 5. I know that you do medical writing. Is it difficult to switch between that and writing fiction? Not really. Itâ€™s sometimes helpful to switch; it exercises different parts of the brain. But itâ€™s not as different as you might think. Thereâ€™s a lot of science content in my fiction, and that requires a bit of research. The techniques of science writing and middle grade fiction both require a strong narrative flow and an economy of words. I guess the biggest difference is that in fiction you can make stuff up. Thatâ€™s frowned upon in medical writing. 6. Where did you grow up? When you were 15, what did you want to be when you grew up? I grew up in Pennsylvania, Illinois, and New Jersey. For most of my life, I wanted to be a scientist. I enjoyed the arts, but it never occurred to me that I could make a living at it. Art was for fun, and science was for income. It didnâ€™t occur to me that I could combine them until I was nearly finished with my PhD. 7. What was your best High School memory? My senior year, when I was taking Advanced Biology, the teacher picked four of us to compete in a state competitionâ€”a written exam. We were excused from class for a quarter so that we could study together. I felt smart and independent. And we all did really well in the competition and on the AP exam. 8. Where did you go to college? What was your favorite course there? I did my undergrad and masterâ€™s at the University of Delaware and my PhD at the University of Wisconsin. My favorite undergrad course was Vertebrate Zoology. I remember especially a unit on how animals use different strategies to do the same thing. Like swim, fly, dig, run. Think about the way an elephant runs versus a cheetah versus a lizard. Completely different mechanics. Just look at the backbones. The elephantâ€™s spine is relatively stable. The cheetahâ€™s bends vertically. The lizardâ€™s bends horizontally. It really opened my eyes to the relationship between structure and function. OK, Iâ€™m a geek. 9. If I told you tonight’s dinner was your last meal ever, what would you request? (appetizer, main course, dessert). Iâ€™d start with salad with warm goat cheese toast, then pintade (guinea fowl) over homemade pasta with a wild mushroom cream sauce. For dessert, maybe a chocolate crÃ¨me brulÃ©e with a touch of orange peel and Grand Marnier. These are all parts of memorable meals Iâ€™ve eaten in France, except I added the chocolate to the orange crÃ¨me brulÃ©e, because I think that would be good. And maybe some fresh strawberries or cherries on the side. 10. And the important question: Favorite Chocolate–Dark, Milk or White? Thanks, Jacqueline. It was great having you over at the blog. Great interview. I want to read this book! Interesting interview! And I loved Eddy – though I never knew the actual label was Aspergers…but his struggles were very believable, nonetheless! “You can never have too much science.” – I agree! I’m also a middle grade science fiction writer, who believes we need more science-related books at this age group. Edison looks great and I’ll add it to my TBR list and rec it to some middle grade teachers I know that are looking for science-related books! Love the interview. I keep learning more interesting details about Jacqueling. Yes, yes, yes! You must read this book if you haven’t. It’s a delight and an education. Jacqueline, I’m going to invite myself over to your house to eat. And dark chocolate – yes. ‘Nuff said about that. “Eddy” is truly one of the year’s best books! I hope ever more middle graders find him.